I was sincerely not expecting the first box to arrive so quickly, though likely a mistake on my part it's an extremely good one! I need to first take a moment and send out a huge THANK YOU to all who have ordered books, prints and originals! You are helping to make this a successful project and I can't express enough my gratitude for all your amazing support. Because the first box came earlier than expected, I am still waiting on my shipping labels (oops!) but in the mean time orders will start to be prepped and ready for shipping. Many of them will start to go out at the end of November, so watch those emails for shipping notifications! So far very few of the embellished prints have been ordered, so I'd like to take a moment to remind everyone that they will only be available to order until December 12th. That means if there are designs that have no orders, zero of those prints will be made. Designs that have some orders will get a couple extra as "just in case" prints, but that's it. In the future none of the Dragonbrushed designs will be offered as embellished prints, so this is your only chance. One of the best benefits of the LE prints is that they will be printed in a much higher resolution than the book, with more vivid and accurate color to the originals, and the largest possible print that will be offered as well. Research & testing for Special Edition prints! After looking at dozens of printers, considering different finish options and paper types and costs, I've finally narrowed down where to get the special edition prints made! Why all the research, why not just go with the usual printer? Normally this would be an easy thing to do, but I want a very specific look and feel for these prints including a printed gold border - and just as important I wanted to be able to embellish them with the same mica-metallic watercolors I used on the original paintings. These are special edition after all, so it's important to go all out! As it turns out however, gold borders and watercolor-type papers are two things that are very difficult to put together. Either the paper was wrong and I could get the border printed, or the paper was right and the border couldn't be printed. For this, the exact look and feel of the special edition prints could come down to two versions - which is what I will be sorting out this week. Today test prints from one shop will be ordered, and later this week I will visit in person another shop to see what they can offer. One way or another I feel I'm getting very close to what I envisioned for the prints that will only be available during the launch! 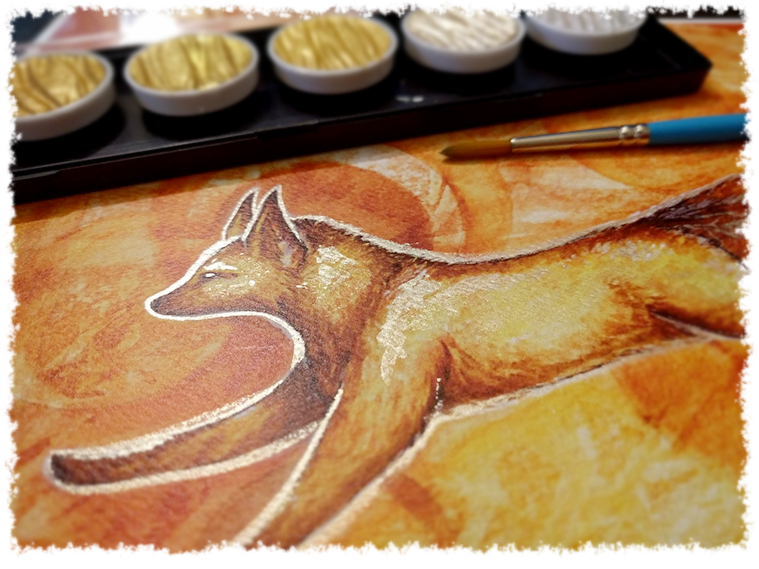 Test metallic watercolor done on the print "Dream Fire Fox"